I think most of us have this feeling of freedom momentarily, in a sense of opening our minds to different and strange and new feelings and jump right into it. Momentarily, because we know somewhere along the road that it would end one way or another. It would end, and we know there are things to do that we have responsibility about, things that we actually care about, people we care about. We cannot live alone, we still longing for love from other people, people we know about, and whom we also love. We still have binds in a real world. We are not an eagle, we’re simply a kite. We reject the fact, denying the truth of the binds that connect us to the people we care, saying to ourselves that it is for the sake of freedom and personal happiness that we should fulfill the long solitary journey, away from friends and family and to get to know another place, another people, another side of the world. It is the same cycle over and over, if we take a step back and look at our life from the audience point of view. Human was designed as a social creature; that means we cannot survive without being with someone else. Even the most introverted person would feel the need to be with someone at one point in life. The deluded person who tried to fulfill the “true freedom” by cutting all the ties would end up making another binds, with the new people or a new place or a new responsibility. Like a fresh start, not that there is anything wrong with it. Fly high, feel the wind breeze all over us and enjoy the view. Absorb all the knowledge we learn about, while we see everything up high. 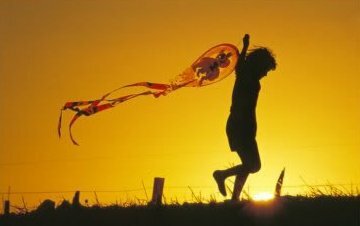 Then, when the time comes to roll down the strings, be a good kite. Be humble while flying down eventually, be patient when we need to be stored in a cabinet. Very interesting thoughts to consider! Thanks for making me think about this in this way 🙂 Yeah, I flew away from America and, like you said, ended up floating for a while before settling down all over again somewhere else. Yeah, it was sad and beautiful at the same time. But for me, what makes traveling beautiful is also the thought that you’ll be coming home after the adventure, to someone to tell all the stories to.